We’d love your help. Let us know what’s wrong with this preview of Nasty Leftovers by Guy L. Pace. Reality is back on track, but the world is devastated with only a remnant of humanity left. On a mission to restore Washington, D.C., Paul Shannon and Amy Grossman must face a sinister presence left behind by Satan. In the ensuing battle, physical and spiritual warfare is waged against the possessed, hellhounds, and even the evil presence itself. In this fast-paced sequel to Reality is back on track, but the world is devastated with only a remnant of humanity left. On a mission to restore Washington, D.C., Paul Shannon and Amy Grossman must face a sinister presence left behind by Satan. To ask other readers questions about Nasty Leftovers, please sign up. where do I get a mobi copy to review? Recommends it for: Young adults, those who like Christian fiction. The story takes place after what must have been one heck of a battle involving all kinds of creatures, that took place in the book, 'Sudden Mission', one that I hadn't read. Despite that, the story holds up as a standalone, but you will want 'Sudden Mission' (I at least do) if you read 'Nasty Leftovers' first. This reminds me, I really hate the title. It is the only thing I hate about this book. The story takes place in the post-Sudden Mission mess with little pockets of sanity and highway men eagerly waiting in-between. A mission trip from North Carolina to post-Washington DC to help any survivors. Demon activity with possessed souls and hell hounds call upon Paul Shannon and his girl friend (not girlfriend) Amy to once again do battle. Paul is armed with a protective vest and a sword that belongs to one of God's angels ( I forgot which) and Amy with a Bo staff and the martial arts training to use it. The story goes into great details with the exploration of DC, finding survivors, setting up centers around the area to process and feed the people left behind in 'The Troubles' as the characters refer to what happened in the last book, and the security necessary to stay safe and to keep the survivors safe. The problem is with a demon, and his hell hounds. The necessity to release the survivors from possession by the demon, and the battles to get to the demon through the hell hounds. I am sure this was aimed at a younger crowd, maybe the younger side of YA, but I think you will like it. I did. Nasty Leftovers by Guy L. Pace is middle-grade to young-adult dystopian adventure with strong Christian themes and content. The book has a great cover, though to be honest I found the title off-putting while, I guess, appropriate to the content. Nasty Leftovers follows on from Sudden Mission (which I haven't read) though we get the gist of what happened in the previous mission when Paul and Amy must battle waves of monsters and the Adversary to reset reality. Now Paul's church send a mission to Nasty Leftovers by Guy L. Pace is middle-grade to young-adult dystopian adventure with strong Christian themes and content. The book has a great cover, though to be honest I found the title off-putting while, I guess, appropriate to the content. Nasty Leftovers follows on from Sudden Mission (which I haven't read) though we get the gist of what happened in the previous mission when Paul and Amy must battle waves of monsters and the Adversary to reset reality. Now Paul's church send a mission to Washington to rescue survivors of these 'troubles', yet when they arrive something is seriously wrong with those they hope to rescue and it seems that some of the Adversary's fearsome minions remain. Paul and Amy must fight against evil with the special gifts they were given on their previous mission - the sword, vest and vials. The narrative flows well. Paul and Amy are likeable characters and work well together. Nasty Leftovers has a methodical and linear plot and a long lead in before any real danger, though I was curious enough to find out what caused the survivors strange behaviour to keep on reading. Things begin to speed up at the end and the final showdown is dramatic and gripping. Prayer, Bible reading, and faith is incorporated throughout the book. For me the supporting characters could have been more interesting (not just a sum of their church, family or mission roles, though a couple of characters show glimpses of interesting pasts) and perhaps could have shown more real struggles and even internal conflict in such a difficult and dangerous mission. Though of course, most of the focus is on Paul and his fight against the enemy. Overall, an enjoyable read suitable for middle-grade to young-adult church-goers who love adventure games and stories with a strong spiritual vibe. 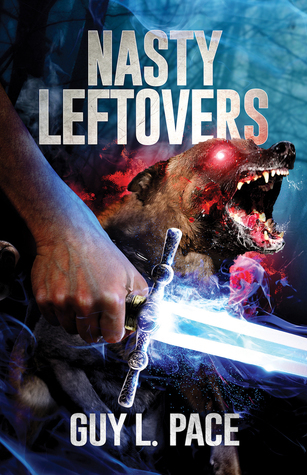 The YA Christian Fantasy novel, Nasty Leftovers, by Guy L. Pace, presents a group of Believers on the mission field in Washington, D.C. after the incident of 'The Troubles.' I didn't realize this was Book #2 in the Spirit Missions series. 'The Troubles,' I gather, represents the Post-Tribulation or Rapture of the Christians/Church setting the stage for Armageddon. The story follows teenagers Paul Shannon and Amy Grossman, with a mild romantic attraction depiction in the book, their families, other friends, pastors, and Church Elder/Mission Leader Ray Franklin. The three hold the story together, and Paul and Amy work well as a tandem. I'm guessing more information about them can be found in Book #1, Sudden Mission. But they're likable, heroic, and faithful. So what's the mission? To gather and save as many survivors as possible. The survivors appear and act like zombies without having to venture too far out. It's strange. To convert these lost souls, Paul, Amy, and the others must confront some nasty, evil, manifestations from hell. I knew something was awry when Paul finished setting a personal best in a mile run and made mention of a memory that harkens back to a confrontation with the Adversary. Now, those who know their Bible, realize that name references Satan. Okay. Then the local community barters for food just to survive. Electrical grids have gone, and the people rely on an intermittent nuclear power source. Not just Paul's neighborhood, but the nation experiences devastation and have to make due the best they can with communications cut off. Okay, so we're talking Post-Apocalyptic Fantasy. Then shortly after that, I read that Paul and others battle zombies, aliens, killer monks, samurai, and the Adversary. So now I think what have I stumbled upon here? It was actually funny because Paul and Amy made references to monsters and "...Angel stuff..." so matter-of-fact I knew I was behind aka this is Book #2 in the Spirit Missions series. With all of that, I anticipated a wild ride, and I got some of that. Nasty Leftovers moves with good pace, it's not a very long book, but it seems all proceeds too smoothly for our heroes. Once essential information comes to light, the teams use that information and then execute their plans pretty flawlessly. Comparing Nasty Leftovers with Kingdom Come by Justin Coogle, another Christian Fantasy that deals with spiritual warfare, the significant catastrophes dwindle the ranks of heroism in Coogle's book and raise the high stakes even higher. This doesn't mean Nasty Leftovers isn't compelling, it just needs more nastiness or complication for the good guys. Again perhaps, this was what happened in Book #1, Sudden Mission. I can only go by what's present in Nasty Leftovers. Now, having said that, I need to allude to several plot points without giving them away to those like me who hadn't read, Sudden Mission. With that statement, I'm assuming these plot points occur in Sudden Mission. Aside from the faith of the Christians on the D.C. missions trip, certain let me just keep it simple, weapons, in use by some community members, don't exactly lend themselves to failure. Despite God's utilizing of fallible men and women, these weapons can't fail, so that skews those plans toward flawless execution. I believe readers who read the novel will understand the references. By the way, nice touch, Mr. Pace. Those left behind for real may very well encounter this kind of manifested good during that time. Sure surprised this reader. A minor point that I have to point out exists in a couple of handful of typos. You know, it's really hard for authors to top their previous work, it really is. It is also very rare when it does happen. Guy L. Pace is one of those rare authors. Book one ended and honestly it ended in such a way that that could have been it, though luckily it wasn't! Nasty Leftovers picks up where Sudden Mission left off, which I truly love. And though we had to wait (feels like) so long, you can still feel everything I received this book in return for an honest review. Nasty Leftovers picks up where Sudden Mission left off, which I truly love. And though we had to wait (feels like) so long, you can still feel everything from the first book.... yes, even the heartache. I honestly didn't think the monsters could be topped. I mean I really thought Mr. Pace pulled out all the stops with the first book, so I have to admit, I didn't hold much hope for book two... Until I read it and then oh holy goodness almighty! Between the Hell Hounds and the Imps, there was no sleeping for me they freaked me out so bad. I also really loved the story line in this one as well, though I think everyone will get something different from it, what I got and loved was that no matter how far gone you are even when you think there is absolutely no hope, ...there is. As long as you accept God and really want forgiveness, He is ALWAYS there and He ALWAYS has His arms open for you. The action in this book was so awesome and the ending was phenomenal! I loved seeing the characters continue to grow and I also really enjoy that with the new book, the still remembered old characters who are no longer around. I was asked by the author and given a pre-release electronic copy free of charge to review before its review date on the 15th March, 2016. This is a great sequel to Sudden Mission. It follows very well from this first instalment on all levels, characters, plot, flow and spiritual themes and it really makes this instalment a worthy sequel. We all know of the rut that sequels of books and movies can fall into, but Pace has avoided this and this instalment should act as a good springboard for the I was asked by the author and given a pre-release electronic copy free of charge to review before its review date on the 15th March, 2016. This is a great sequel to Sudden Mission. It follows very well from this first instalment on all levels, characters, plot, flow and spiritual themes and it really makes this instalment a worthy sequel. We all know of the rut that sequels of books and movies can fall into, but Pace has avoided this and this instalment should act as a good springboard for the furtherance of this series and his craft for that matter. I said in my review of Sudden Mission that Pace seems to have found his niche in writing for the teen/young adult market and genre. Further proof is found in this instalment. The plot is tighter, characters further developed and more relational, especially Paul and Amy, not only as a spiritual warrior team established from the previous novel but as a deepening relationship as well. Pace has added a further layer of developing romance between Paul and Amy and this seems to add a stronger foundation for them as a spiritual warrior team fighting the satanic forces in this novel. It will be good to see how this develops in the next installment. It is the aftermath of the events at the end of Sudden Mission that forms the basis of this novel. The world has been devastated and decimated on every level and Paul and his church seek to help the survivors improve their situation. They travel to the capital and not only do they find survivors but these people have become demonically possessed and oppressed by a fallen angel still present from the satanic rising in Sudden Mission. It is here that this novel takes off, with a faster pace, suspense and spiritual warfare. The rest of this story is all about caring for these survivors on every level especially the spiritual. Pace accounts very well how the Church group delivered these survivors from this demonic possession/oppression and it is very much spiritual warfare in the biblical sense. I really appreciated Pace not just depicting that they had become saved or delivered but actually showing the deliverance and the salvation account together with its prayer of repentance and follow up. This shows Pace is not just concerned with entertaining his readers but investing spiritual truths and showing the power of the Gospel and Jesus' victory over sin and death and all things demonic and satanic. This is especially important to have in such detail for the teen/young adult reader audience to know these truths and practices. Pace outlines this in much more detail with the final spiritual warfare battle both in a physical sense and spiritual. Pace has accounted in more detail in this novel the final spiritual battle than he did in Sudden Mission and it is here that he shines again in both keeping true to biblical principles of spiritual warfare and in creating action and suspense. Young readers (and any that are older!) should see the encouragement that Pace has included here, that youth (or any age for that matter) does not mean an inability to use these biblical principles of spiritual warfare to confront the demonic/satanic or sinful influences/entities that we will encounter in our lives. Pace has depicted Paul as flawed but has a confidence through his faith and relationship in Christ to defeat not only the fallen angel but also the hellhounds that this fallen angel uses to entrap the survivors to hell using the power of Jesus' name and the authority given to him by being born again and having a relationship with Jesus. Actually, I stole the idea from the TV series Supernatural. And, some of my research has salt used in protection from demons and evil. Mostly, I was grasping for some way to contain the hellhounds, since nothing else seems to be effective. Some folklore uses salt on thresholds and window frames to protect from evil spirits. I just took it a little further and hope it provides a symbolic barrier. It also can be blown away, rained away and disturbed by other animals, so it isn't perfect protection. I googled this and came up with similar answers as well. Spiritual/biblical basis or not, this certainly added another layer of suspense to the battle that Paul and Amy had against the hellhounds and the rest of their Christian community, it also enhances the spiritual warfare aspects of this battle without detracting from the biblical principles and practice of spiritual warfare. Nice use of poetic license. As an adult, when I read such compelling, well written and constructed novels while not only entertaining but educating in biblical truths and application while also spiritually uplifting and improving my relationship with God, I really wish I had these type of novels when I accepted Christ at 19yrs of age. I applaud authors such as Pace for ministering to this age groups as these are our future and need to be prepared spiritually for the future. I look forward to more of this spirit-filled fiction from Guy L. Pace. His commitment to providing fiction that is bible based, honors God and leads his readers to the Gospel and Saviour. He was a Navy journalist, and worked primarily in community newspapers as a reporter, photographer, editor and finally a managing editor. He changed careers in the mid-80's getting into computer support, training, networking and systems, and eventually in Guy L. Pace, born in Great Falls, MT, grew up in the Pacific Northwest. He served in the US Navy, including combat operations in Vietnam in 1972. He was a Navy journalist, and worked primarily in community newspapers as a reporter, photographer, editor and finally a managing editor. He changed careers in the mid-80's getting into computer support, training, networking and systems, and eventually information security. He retired in 2011 after more than 20 years working in higher education.